Warm the heart (and the toes) with our satisfying and divine onion soup with homemade croutons. You’ll need two spoons! In a large Dutch oven over medium-low heat, melt the butter and add the onions. Add thyme, bay leaf, salt and white pepper. Simmer and stir often with a wooden spoon until onions have reduced, are tender and caramel in color, approximately 25 – 35 minutes depending on the stove. Do not burn onions. Add dry white wine to onion mixture and remove bits from the bottom and sides of the rondeau. Add beef stock. Raise heat to medium, boil, then reduce heat to simmer and cook for 10 more minutes. While cooking onion soup, preheat broiler. Cut baguette into slices, croutons, and gently toast on a baking sheet for 2 – 3 minutes. Remove from oven and sprinkle generously with grated gruyere. Return croutons to pre-heated oven and melt cheese atop croutons for 1 – 2 minutes. 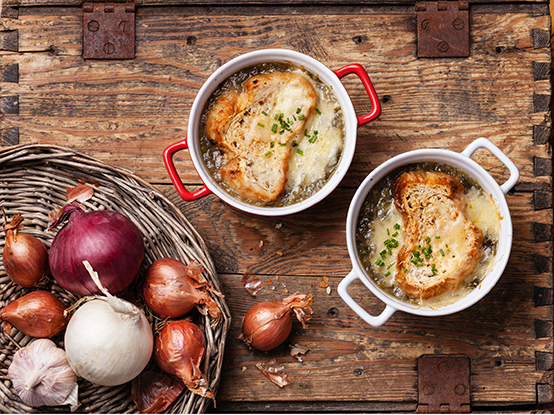 Ladle onion soup into bowls and add a dash of Sherry. Top with gruyère croutons. Serve immediately and serves 4.